The audience entered Moon Falling to a striking image of six dancers lying on the floor—the strong influence of visual images in Veronica Lee-Baik’s choreography was evident from the get-go. The performers pulled, hand over hand, a seemingly endless red string that descended from the ceiling and piled in a tangled mass around the their throats. Aluminum dryer vents hung suspended from the ceiling—each contained an Edison bulb that transformed them into twinkling industrial chandeliers. The dancers wore beige leotards with three-dimensional earth-tone flowers that cascaded in organic patterns across their bodies and hair teased into high-lofted nests. Lee-Baik’s company, The Three Yells, presented her latest work this past weekend (November 7-9) at Velocity Dance Center. All in all, the visual elements of Moon Falling showed a careful crafting that, unfortunately, did not always extend to the design of the dance. After such a drawn-out opening image, the dancing began rather suddenly with a full-bodied unison group phrase accompanied by dramatic violins, emotional piano, trumpets, and soaring vocals. The unison floundered and didn’t quite support the intensity of the music, which felt like a cheap attempt to dictate the audience’s emotions and made it hard to have an authentic experience with the movement. Though it got off to a bit of a rough start, the quality of Lee-Baik’s choreography was a pleasure to watch. Highly physical and rhythmic movements were punctuated with challenging floor-work, and the dancers ricocheted through the space with skill. Sharp throwing of limbs and creature-like qualities added edge to beautiful lines, swiveling hips, and quick, graceful transitions. Lee-Baik’s strong imagery was ever-present in the choreography as well. At one point, two dancers crawled foot-to-foot to create one joined being, and other times dancers spun on the ground back and forth, trapped between their partner’s legs. Lighting choices also assisted in crafting this imagery. 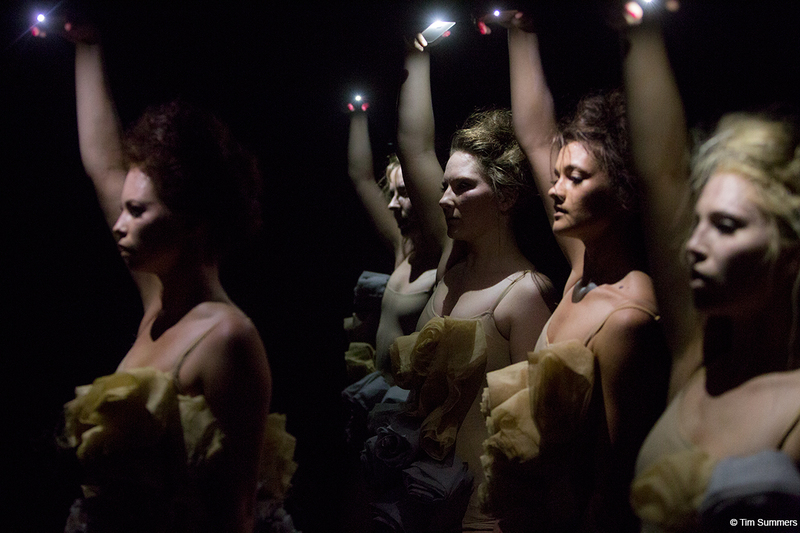 In one of the most successful sections of the evening, each dancer held a phone with the flashlight function on as they danced in the dark. Where they shone the light was carefully choreographed to reveal tiny details one minute and giant shadows the next, each source of light feeling simultaneously like a signal for help and a searchlight on the brink of discovery. Depictions of struggle also made a distinct appearance, complete with over-performed breathing and pained faces. It felt unearned. Where was the build to this struggle? There was no time or structure in which to establish a connection to these dancers that would make them easier to identify with in extreme states. The use of performed struggle along with the persistence of emotional, building, neo-minimalistic tracks made it feel like “meaning” and “emotion” were being shoved down the audience’s throat. The performers even engaged directly with the audience: a dancer handed me a wad of yarn and whispered “have courage,” to which it was hard not to respond with raised eyebrows and a sardonic “Really?” The notable exception to this annoyance was the captivating Kaitlyn Jane Dye, who was so committed, so grounded, and such a mature performer that she actually managed to make even the most clichéd moments believable. 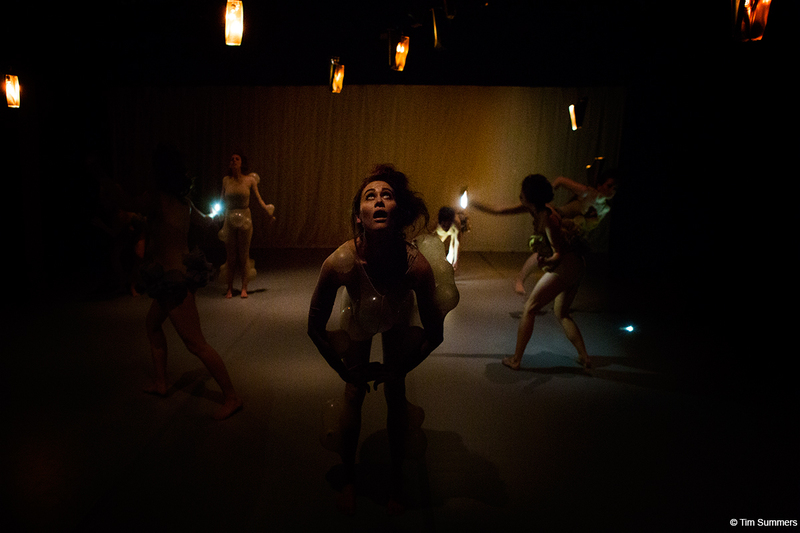 There were many elements at play in Moon Falling, which may be why the piece never fully arrived at something cohesive. The structure and logic of its world seemed to meander until the last third of the piece, when it finally began to arrive. This was marked by a shift to silence where the dancers performed a tranquil dance with Tibetan bells bathed in blue light. Here, the piece began to find a point of view and a sense of purpose. Across the board, it felt like the biggest misstep in Moon Falling was the lack of editing. The almost constant presence of too many elements muddied up the piece’s identity, making it hard to swallow as a whole. Expansive topics such as environmental degradation, which is cited in the program, can be tricky to convey without becoming vague. Fulfilling ambitions of a sweeping masterpiece is even trickier. The effort is certainly not without its merits, but sometimes less is more.